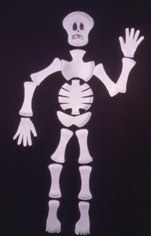 Paper-Plate Skeleton — Perfect for hanging from doors and windows, this scary skeleton is easy to make. Cut white paper plates according to pattern. Join parts of skeleton by punching small holes with a paper punch at each point of contact. Tie parts together with string. Draw or paint features on skeleton’s face. Accent the skeleton’s scary face by cutting out eyes, nose and mouth. Halloween Sandwich Surprise — Make a Halloween face on a cheese sandwich. Cut a jack-o-lantern face on one slice of bread. Add cheese and second slice of bread underneath bread face. Serve plain or toast under broiler. A clever combination is dark rye bread with yellow cheese. Ghost Suckers — for a creative treat to give neighborhood ghosts and goblins, make ghost suckers from, round suckers and soft white tissues with yarn. Place a sheet of tissue over the top of each sucker, gather it under at the bottom of the sucker and tie it with a piece of black or orange yarn. Make two dots for the eyes with a marking pen, and your ghost is ready to be a treat. Ghost Chocolate Pie — Add an eerie Halloween decoration to your favorite chocolate pie. Buy a preformed crust or make one of your own. Prepare chocolate pudding mix to go into the pie crust. Then whip cream, adding just a little bit of sugar at the end of the process. Draw a ghost shape on the pie. Then place the whipping cream into a decorating bag or a gallon zip-top bag and cut out the corner. Fill in the ghost with the whipped cream in the bag. You can use a knife to give the ghost some texture in the whipped cream. Place two chocolate chips on the cream for the eyes. Another fun thing to do is to draw a pumpkin face on several oranges and then put them around the ghost pie.